For a change of pace I slept through until 8 and took my time in the morning since the weather did not look very inviting. 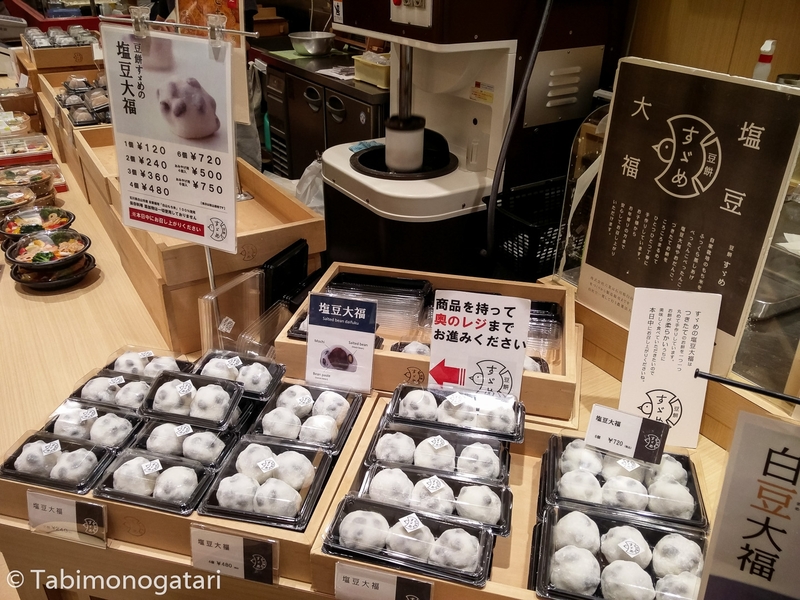 For breakfast I chose a shop inside the station that specialized on mochi and daifuku. 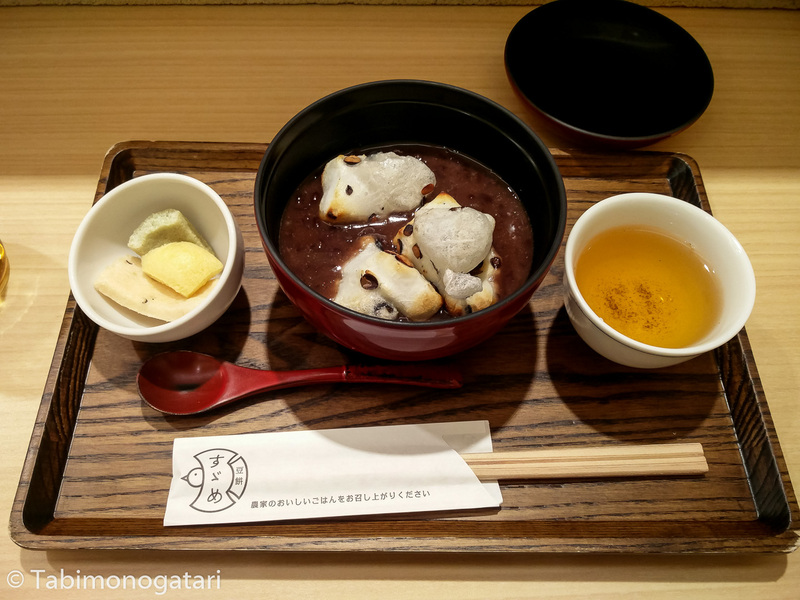 The zenzai menu was a great deal with the soup itself containing freshly baked mochi and the accompanying tea from the region. 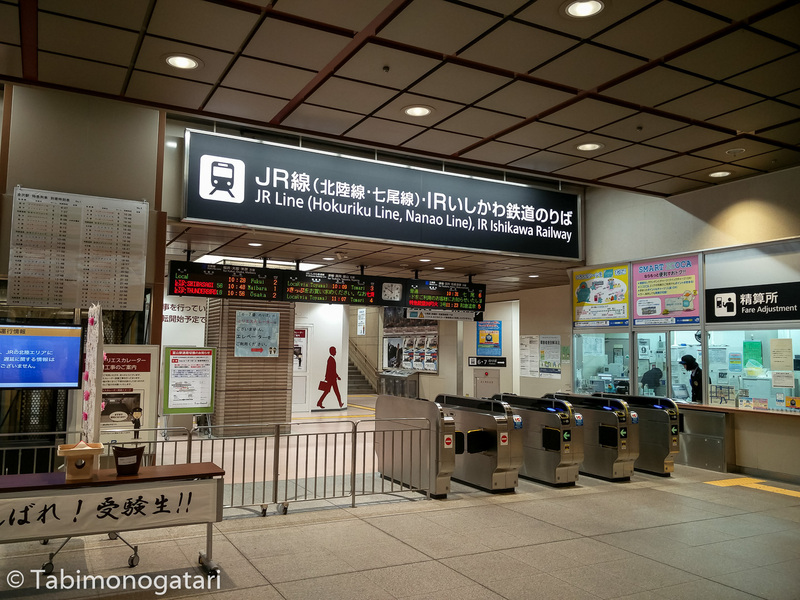 Having no fixed plans, I took a closer look at the shopping center next to the station and bought some things at Muji, one of my favorite brands my favorite anti-brand. The shop sells furniture, cosmetics, clothing and food items without any branding in a consistent design language. At a book store I skimmed through a local guide book about Kanazawa written in Japanese to find a nice seafood restaurant. Thanks to this, I had a delicious kaisendon close to Omicho market for affordable 2000 yen, much cheaper than at the restaurants inside the market. 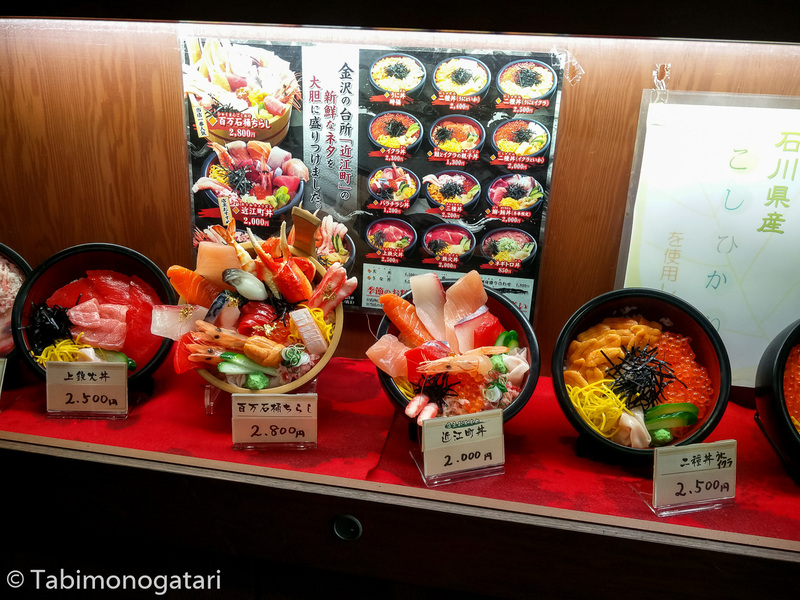 As always, the plastic imitations look as authentic as the actual dishes. Compared to yesterday the market was much less visited – today is an ordinary work day again after all. One more time I tried some of the freshly prepared seafood skewers at the same shop as yesterday, this time octopus and eel. On the way back to the hotel I booked seat reservations for today and tomorrow’s trains. Finally I came up with an idea what to do on this stormy rainy Tuesday. 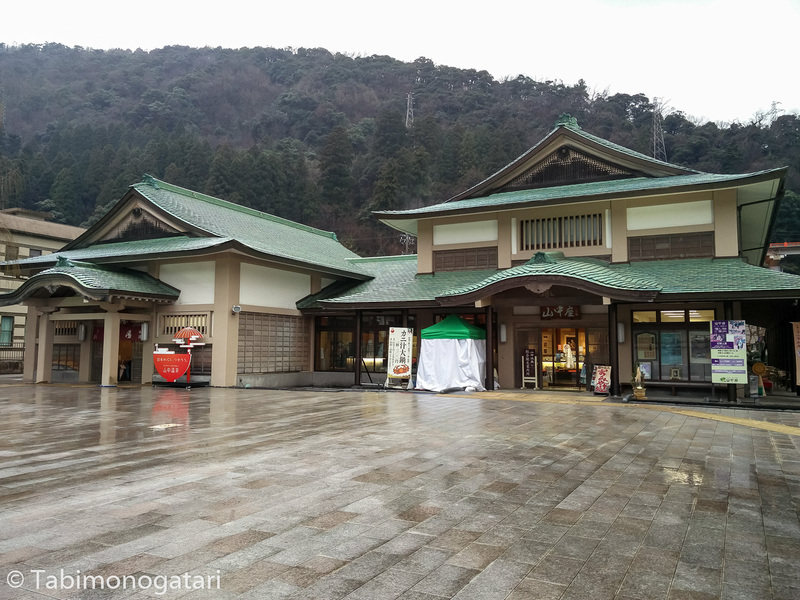 Not far from Kanazawa lies Kaga Onsen, consisting of four secluded onsen towns. 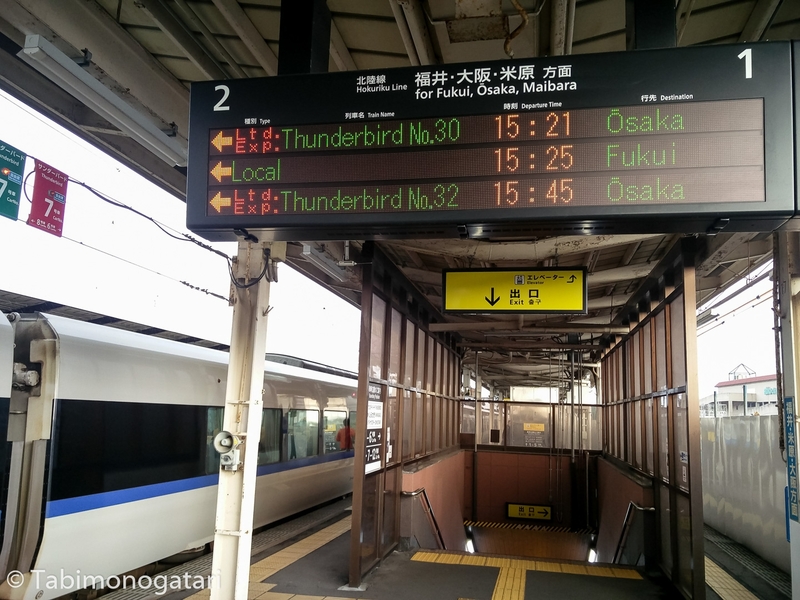 With the Thunderbird limited express it took me half an hour to reach Kagaonsen station, from where a bus connects to Yamanaka Onsen. This town is the most remote from the station along the Kakusenkei gorge. When I arrived, it began hailing all of the sudden, but stopped again soon. Unimpressed by the weather, the bus left on time and passed through Yamashibu before reaching Yamanaka. 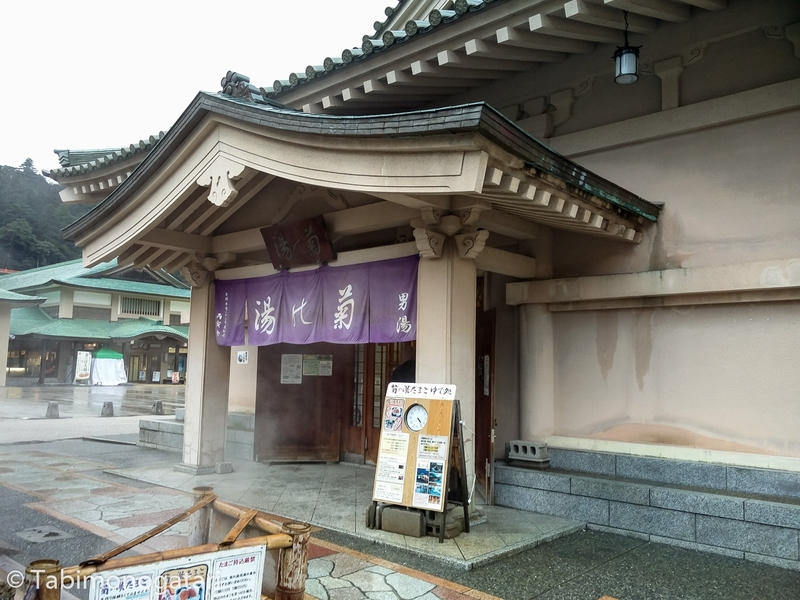 The bus stopped directly in front of Kiku no Yu, a traditional public bath house that is characteristic of the Kaga region. This bath had two separated houses facing each other for the two gender-separated baths. This was the first time for me seeing something like this. In front of the door the escaping steam heightened my excitement and I entered through the sliding door. At a vending machine I bought an admission ticket for 400 yen and rented a small bath towel for another 200. Later I learned that I purchased the towel with the name of the onsen on it, what a nice surprise. When I entered the changing area, it was full of people, all of them old men, exclusively locals I assumed. In Niseko and Kusatsu I shared the bath with men of all ages and often foreigners, too, while this is the first time entering a bath only visited by locals. Surely I stood out a lot like that, but everybody minded their own business, except for one man I briefly chatted with. There was one big bath with a mural, like in a sento. The water was warm but not too hot, also it had a slightly basic pH, very different from the water in Kusatsu. When I left the bath, it was already dark. The next bus would only leave in half an hour, so I took a look at the gorge in the West of the town. When I arrived at the bridge leading across the river I was taken aback by the beauty of the scenery. In the dark I was not able to take good pictures, so I will show you pictures from a different season. 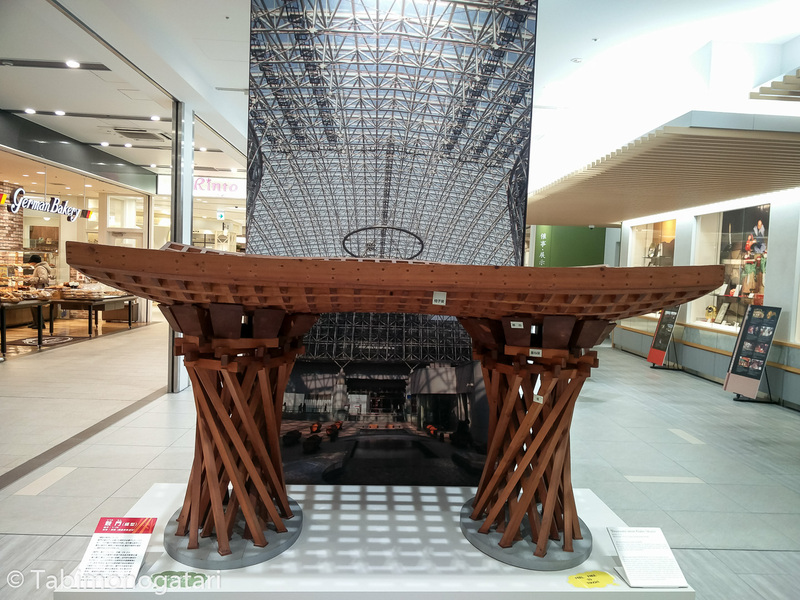 Seeing this, Yamanake is now on my visit-again list. Before leaving, I encountered a butcher shop advertising croquettes filled with Sukiyaki beef. You must know me well enough by now, that I did not hesitate long to try it. I wonder why we do not have something similar in Germany. One more local dish was left on my list, the infamous Kanazawa Curry. Just recently, Asienspiegel has published an article about the dish that made me visit Turban Curry myself. 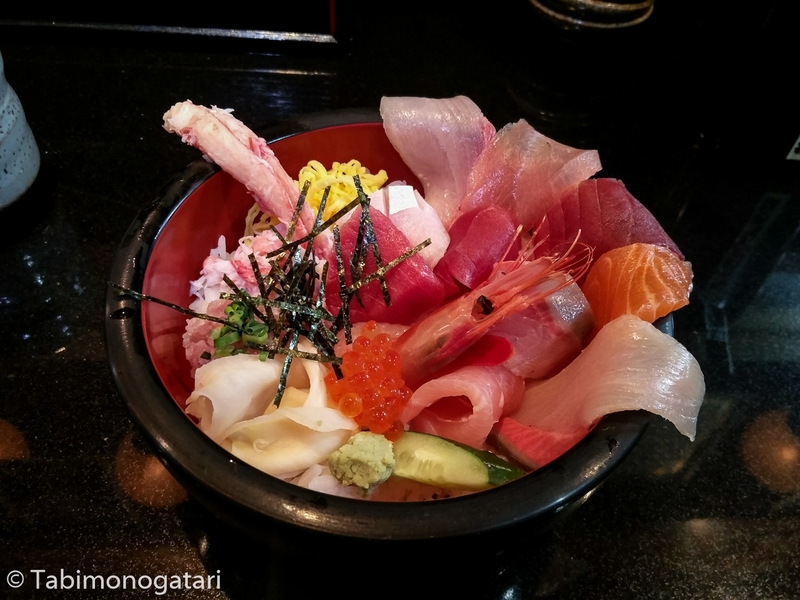 When I arrived in Kanazawa at 7 pm, the restaurant was unfortunately already closed, but I found an alternative place to try the dish. 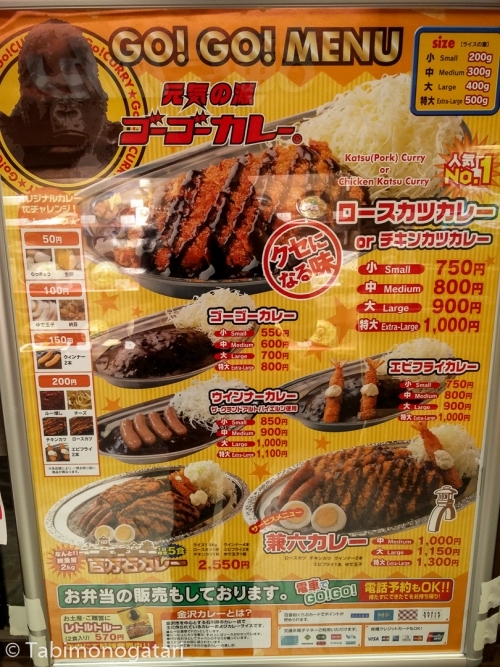 Right inside the station is a branch of Go Go Curry, one of the two big national curry chains. Actually, the chain originated in Kanazawa and serves Kanazawa style curry in the whole country. In just two minutes the dish arrived on a metal plate with plenty of cabbage. 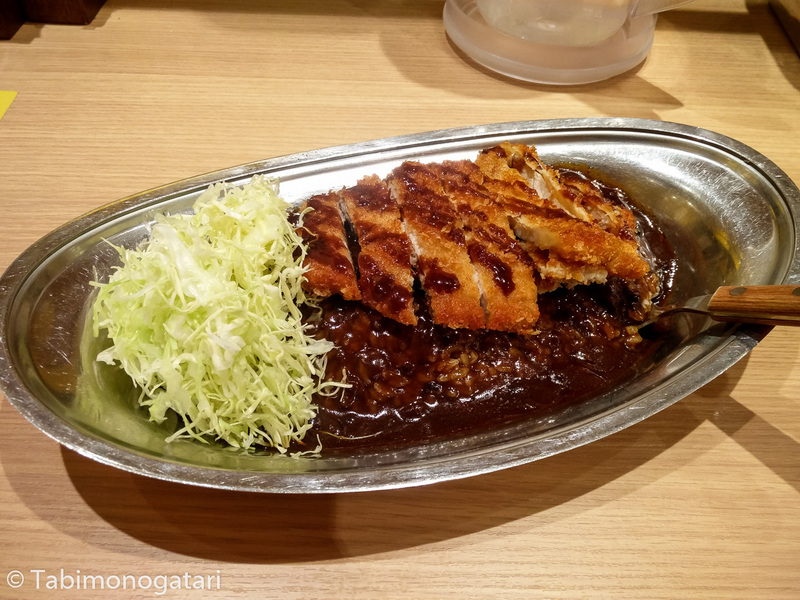 The thick dark sauce was full of flavor and had a nice spiciness to it, while the cutlet itself was crispy. Tomorrow I will leave Kanazawa and head to Takayama, the culture-rich town in the mountains of Gifu prefecture. 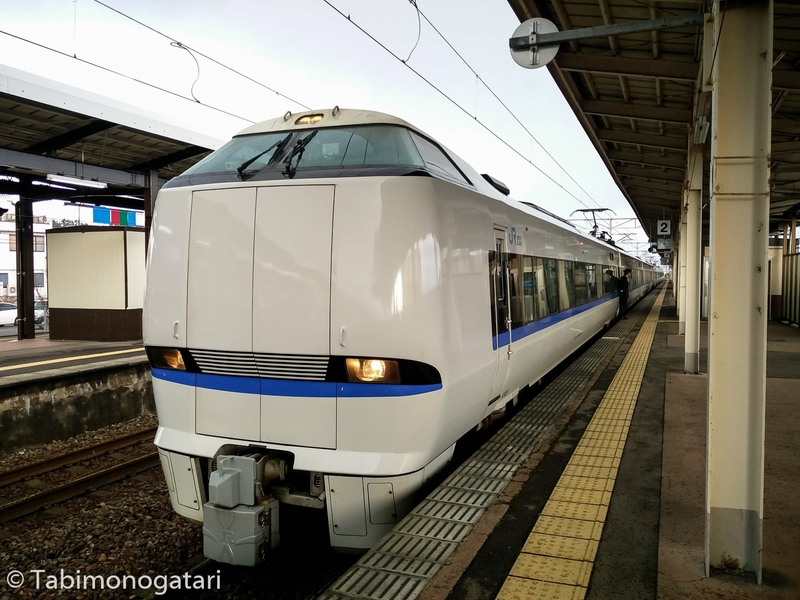 On the way I will make a brief stop in Toyama.